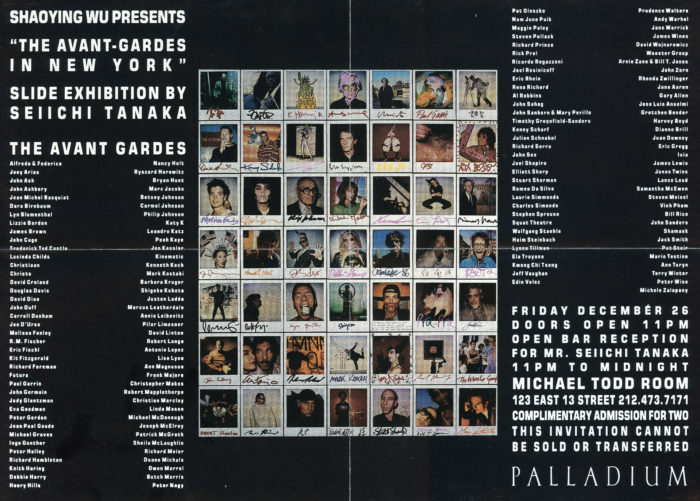 Small poster for The Avant-Gardes in New York, a slide exhibition by Seiichi Tanaka at Palladium, c. 1980’s. ‘The Avant-Gardes’ included Jean-Michel Basquiat, Christo, Futura, Richard Hambleton, Keith Haring, Debbie Harry, Mark Kostabi, Barbara Kruger, Ann Magnuson, Andy Warhol, The Wooster Group, Bill T Jones and many others. Poster was mailed folded, and so has two crease lines.